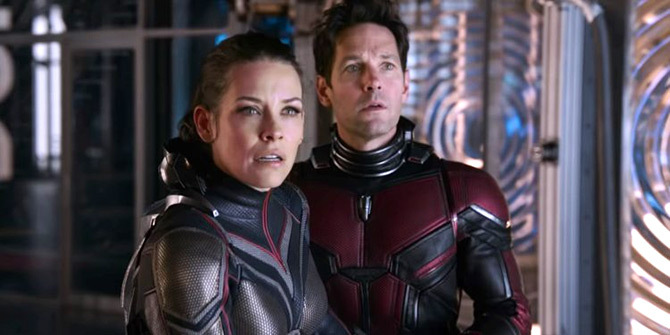 Rediff.com » Movies » Ant-Man and the Wasp Review: Fast, fizzy, fun! Ant-Man and the Wasp Review: Fast, fizzy, fun! The smile stays on long after you've left the theatre, says Sukanya Verma. For a premise where the main guy can size-shift from ant to giant, the struggle is surprisingly real. No matter how fantastical the high jinks get, the people under the ultra-equipped suits are every bit flesh and blood. Throw in tons more of the genial vibe and cheerful humour that made the first Ant-Man moviesuch a lark and director Peyton Reed's zappy sequel is the very definition of easy-peasy fun. Following the superhero shenanigans in Captain America: Civil War, burglar-on-the-mend Scott Lang (Paul Rudd) is only a few days away from a house arrest sentence coming to an end and starting life afresh. Till then he has all the time in the world to stage elaborate play hunts and card tricks for his darling daughter Cassie (Abby Ryder Fortson is the right kind of cute). 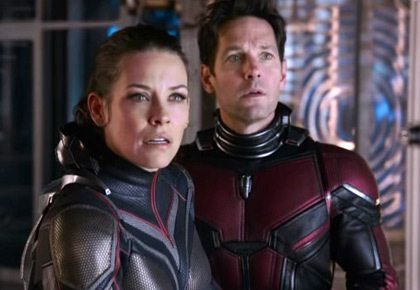 Meanwhile, the other father-daughter duo -- scientist Hank Pym (Michael Douglas swinging between cranky and know-all) and Hope Van Dyne (Evangeline Lily), also on FBI's most-wanted, get Lang on board to bring back Pym's long lost better half (a sparkling turn from Michelle Pfeiffer) from the quantum realm. If the first Ant Man played out like a heist, Ant Man and the Wasp is a fast and fizzy rescue movie doling out wacky action, lively 3D, old-fashioned romance, understated girl power and crazy size metaphors. Truly amazing what a saltshaker can do when blown up to the size of a door in a standout kitchen brawl. The women in Ant-Man and the Wasp -- good or bad, young or old -- are significant to the narrative and complement Rudd's laidback charm with generous dose of dynamism. Especially Lily, her nimble daredevilry in a winged, well-deserved Wasp suit is as effective as her humanity outside it. 118 minutes go by in a blink as egoistic colleagues (always solid Laurence Fishburne), molecularly-imbalanced miscreants (Hannah John-Kamen shoots daggers by the dozen), goofy, 1980s-evoking villains (Walton Goggins grins away to glory) and pestering agents (hilarious Jimmy Woo) pop in to disturb the status quo in a script penned by Rudd, Chris McKenna, Eric Sommers, Andrew Barrer and Gabriel Ferrari. As Marvel Cinematic Universe's most modest franchise, Ant-Man delivers on its promise of levity above spectacle. All the quantum mumbo jumbo, prompting Lang to remark, 'Do you guys just put quantum in front of everything?' takes its license for farfetchedness a little too far. While the titular superheroes get busy making a go of it, Ant Man's feel for wit and goodwill peppers the proceedings. Most of it is a consequence of Lang's delightful dependence on old pal Luis (Michael Peña). Peña continues his scene-stealing comedic streak along with a loony crew. Gags involving truth serums and Russian folklore figure Baba Yaga inject Ant-Man and the Wasp with such infectious merriment; the smile stays on long after you've left the theatre.